Flooded lead acid batteries are by far the most common format for energy storage for both starting and ship’s services applications. As their name implies the battery cells are ‘flooded’ with electrolyte, in this case an aqueous solution of sulphuric acid, in which the lead/lead oxide plates are fully immersed. At least that is the way they are supposed to be, and should be with a bit of maintenance. 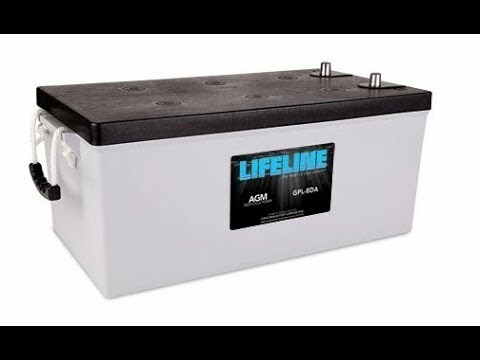 Maintaining flooded lead acid (FLA) batteries can be a bit of an arduous task. The batteries are not always located where it is easy to check their dark recesses for fluid. The electrolyte is very corrosive, and there always seems to be a bit of it in and around the outside of the battery, which will put holes in your clothing, or even burn your skin if you come in contact with the acid. It is important, however, that FLA batteries are monitored for fluid levels for a number of reasons. Longevity and Performance Batteries seldom die, usually they are killed. Notice the word murder isn’t used, because that requires motive and malice; it is more of a case of manslaughter, or in this case battery slaughter, because it is never done with intention or forethought, but rather simply through neglect. 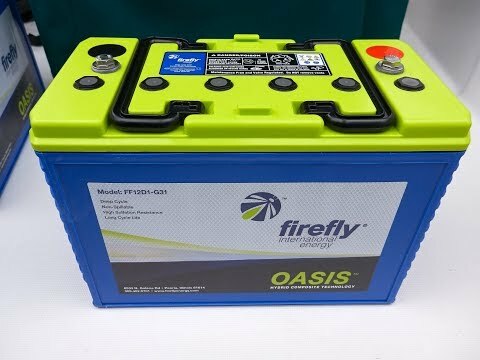 If FLA batteries are left to fend for themselves it is almost inevitable that they will lose some of the water from their electrolyte. 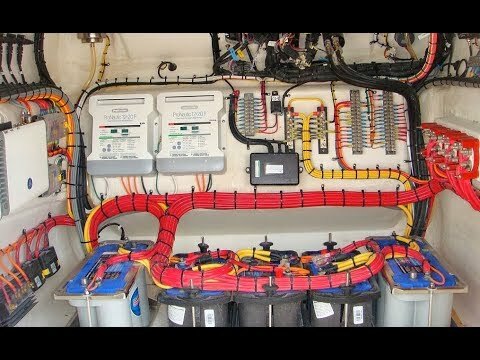 The gassing point for lead/acid batteries is 14.4 VDC in a 12 VDC nominal system, and if that charge voltage is sustained for any length of time beyond the batteries ability to absorb amperage, then hydrolysis in the electrolyte occurs and the water is cleaved into its constituent components—hydrogen and oxygen—and the fluid level drops. Once the level of the electrolyte drops below the level of the plates, and the plate material is exposed to air, the plate area soon becomes irrevocably damaged with the resulting loss of capacity proportional to the area of exposed plate material. 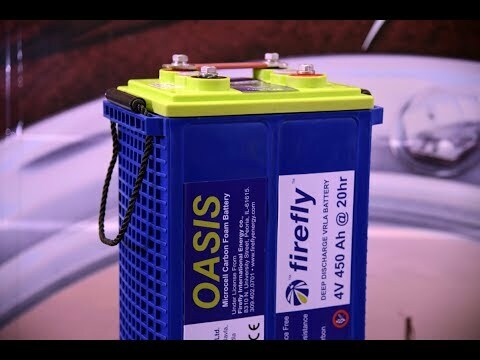 For example, if you have a 100 amp-hours (Ah) capacity battery that is 10 inches tall, assuming the plate material is also 10 inches tall, and one inch of plate material is left exposed to the air and becomes damaged, then your battery is now only a 90 Ah battery. 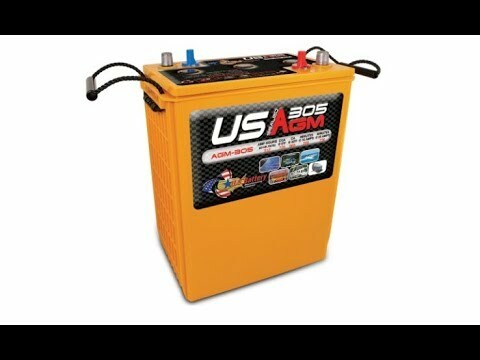 The same math can be applied to a starting battery by focussing on the CCA rating rather than the Ah rating, meaning a 1,000 CCA battery will be reduced to a 900 CCA battery by the exposure of 10 percent of its plate material. By this logic it is easy to predict the inevitable early demise of the performance specs of your batteries by the process of plate damage through air exposure. However, there can be a more sudden and catastrophic failure that can occur due to loss of water from the electrolyte. 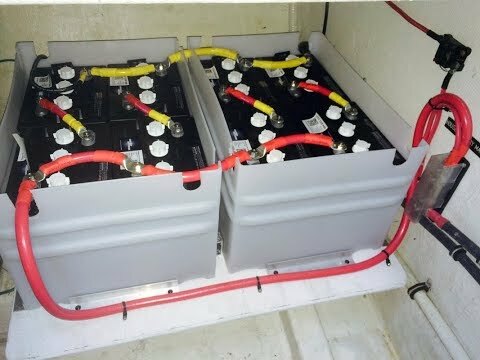 The Battery Big Bang Theory On a recent service call we were asked to do a remove and replace on a bank of 8D format batteries. A battery bank autopsy was to be included with the replacement to mitigate a reoccurrence of the battery’s demise. The owner had pre-warned us that the batteries had suffered a catastrophic failure, and had even included some low resolution photos of what appeared to be cracked battery cases. Upon preliminary inspection we were left in shock and dismay by the grizzly scene we encountered. It was not just a case of a single cracked battery case, but instead two of the three batteries were blown apart, and there was battery acid everywhere. The battery boxes were screwed down, so the penetration holes allowed for electrolyte to seep out through the bottom of the boxes. The lids had been left off after the initial explosion—the owner thought he had hit a log because the explosion was so profound—so the batteries were left in service until we got there, and the hours of charging under duress had caused the electrolyte to be showered far and wide. The clean-up of the hazardous material required a lot of neutralizer and fresh water, and a considerable amount of time. So, what happened? The theory is that the level of electrolyte had been allowed to drop down considerably. 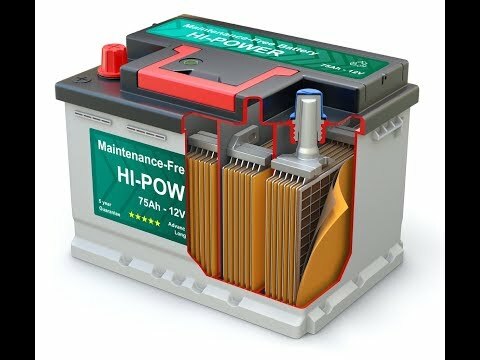 The batteries were designed for starter service, so they were constructed of many thin plates, but unfortunately they were being used for ships service and were subjected to both high amperage charge and discharge from the robust alternator and the inverter/charger. The plates warped and then shorted out, creating a spark. The low level of electrolyte left plenty of room in the battery cell for hydrogen and oxygen gas to accumulate, and the ignition source sealed their fate in a final burst of energy. The Findings There are a few important and relevant findings from this experience. First, even if the batteries are nearing the end their useful life it is still important to keep them topped up at all times. Secondly, screwing down battery boxes defeats the intention of electrolyte containment, which is one of the good reasons for using boxes in the first place. Finally, this may give you another good reason to consider sealed valve regulated AGM batteries as an alternative next time it is time to change out your battery bank, as they require next to no maintenance, and the electrolyte is conveniently infused into the glass matrix.